About four years ago, Cigar Aficionado published an article entitled “Strange Leaves” about how some cigar makers are looking to non-standard tobaccos to create distinctive blends. One of the tobaccos highlighted is Andullo, which has a longstanding Dominican heritage and is typically used as a pipe or chewing tobacco. 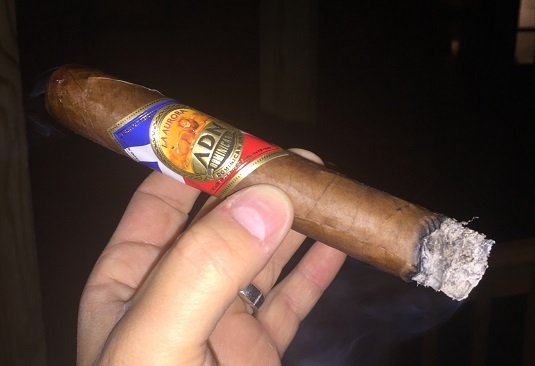 Leave it to La Aurora, the oldest cigar maker in the Dominican Republic, to incorporate this uniquely Dominican tobacco into one of its blends. The new line—called ADN Dominicano—debuted earlier this year at the 2017 ProCigar Festival. Originally, it was only going to be sold within the Dominican Republic. Before the 2017 IPCPR Trade Show, however, La Aurora and its distributor, Miami Cigar & Co., decided to make it available in the U.S. market. ADN Dominicano sports a Dominican wrapper from the Cibao Valley, a Cameroon binder, and filler tobaccos from Pennsylvania, Nicaragua, and the Dominican Republic, including one whole Andullo filler leaf. There are four ADN Dominicano vitolas, each retailing in the $7.25 to $9.25 range: Robusto (5 x 50), Churchill (7 x 47), Gran Toro (6 x 58), and Toro (5.75 x 54). Each is adorned with a slightly toothy, moderately oily wrapper that has several large veins, as well as a Dominican flag-themed band that includes the familiar La Aurora lion. The Toro is firm to the touch with pre-light notes of molasses. The cold draw is effortless. The initial profile is medium-bodied with core flavors of earth, leather, cereals, and some tangy, zingy sweetness that reminds me of barbecue sauce. The finish on the palate is clean with hints of lingering spice and gentle heat. Beyond these impressions, however, there is a noticeable lack of complexity that, at times, strikes me as papery and a little bland, notwithstanding the aforementioned spice and body. As the Toro approaches the midway point, some welcome changes begin to take shape. The overall flavor gets a boost of balance and depth with the arrival of a creamy sweetness. In addition, a taste reminiscent of walnuts emerges and, while the spice seems to recede a bit, the body begins to approach the medium- to medium-full range. The final third is characterized by dense earth, bread, warm tobacco, and black pepper. Throughout, the combustion properties can be slightly frustrating. While the smoke production is good and the draw is clear, the flaky ash tends to fall off the foot haphazardly, and the wavering burn line requires a number of touch-ups to stay even. The star of ADN Dominicano is intended to be Andullo yet, tasting the cigar as a complete blend with its many components, it’s hard to say exactly what role that tobacco leaf plays. I would relish the opportunity to smoke Andullo on its own in order to define its attributes. On the whole, the ADN Dominicano Toro does not live up to the standards I’ve come to expect from La Aurora in terms of either flavor, balance, or construction. That’s ultimately why I am rating this cigar only two and a half stogies out of five.